When it comes to supporting BI-on-Hadoop workloads which SQL engine works best: Impala, Hive, Presto, or Spark SQL? As Hadoop and the SQL-on-Hadoop engines mature, leading enterprises are throwing on more diverse workloads and getting highly performant results. Hadoop is no longer relegated to a platform for data science or batch processing - now companies are also pushing traditional Business Intelligence workloads to Hadoop as well. 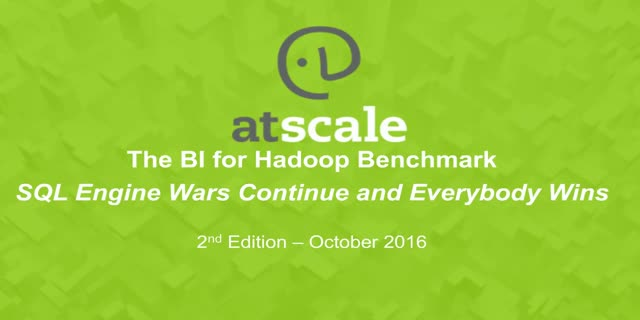 Come learn and benefit from some surprising, and not so surprising, findings in the second edition of the largest BI-on-Hadoop Benchmark Study to date. You’ll hear from Josh Klahr, VP of Product and Trystan Leftwich, Sr. Architect, and learn about how the AtScale BI-on-Hadoop Benchmark tests real-life workloads (big data, small data, high concurrency) across multiple SQL-on-Hadoop engines (Impala, Spark, Hive, Presto...).